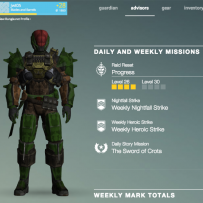 Home » Events » Destiny RAID – Complete! Just completed Destiny “Vault of Glass” RAID. Awesome gameplay experience! My completed mission reward.. a SHIP. 8-( Now I know why people replay the mission several times.. To get kool armor and gear! PS4 – jwt05 – Exo – Titian – Defender – “Devil You Know” Hand Cannon 300 – “Light/Beware” Fusion Rifle 300 – “The Truth” Rock Launcher 267.